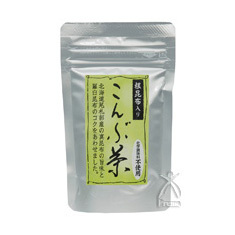 Konbu-cha (Kelp tea) that combines the full-body flavours of Makonbu (Giant kelp), and Umami from the Rausu kelp. Additive-free. -Ingredients: Makonbu powder (Hokkaido), Konbu extract, Rausu Kelp powder, Beets sugar, Salt, Yeast extract.